Over 85 new alchemical tools, weapons, remedies, poisons, and drugs. Entangle your foes with Kyonin alchemical arrows, bolster your allies’ defenses with Belkzen bloodgorge or Pei Zin incense, and disintegrate the armor of entire armies with Thuvian wish alchemy. Details on some of Golarion’s most famous alchemical practitioners and their methods, including the firework makers of Varisia, the derro magisters of the Darklands, and the homunculus crafters of Ustalav. A new class archetype, over a dozen new pieces of adventuring gear, new magic bottles to contain your alchemical creations, and much more! Raise a Toast for a Book That Fills a Hole! I binned my first draught, as most has been said by the others, and decided instead, to celebrate this product in verse. So here's my tribute to the Lords of The Boards. Apologies to all concerned; you know it's in fun. Mikaze was frantic, a hopeless romantic. Inside the pictures he had scribed. Wondered what could be the harm. The Starstone pulsing holy power. The Church is calling Happy Hour! I've got a mid-level bomb-focused alchemist in PFS and I had just started to look into what alchemical items were available from Ultimate Equipment to create a proper alchemical arsenal in my backpack, when I found this book had come out. There's some underwhelming reviews here, but I took a chance anyway. Seems that the reviews before mine are pretty spot on. Spontaneous Alchemy Poisons are the only categories of feats the book covers, and there's only 5 feats in the whole book. Homonculus maintenance, Ooze crafting and Mythic options. The dreaded "a DC 13 Fortitude save negates this effect" rears its ugly head in a few of the new items, rendering them fairly worthless. Having said that, there are a few items that do stand out - Focusing Flask lets you throw several of the same splash weapon at a time and raises the save DC (700gp). Winged Bottle lets you drop a splash weapon from above from 130ft away, and it flies there (1620gp). Durable Arrows (1gp) don't break on a hit or a miss with some minor exceptions (among other "Alchemical Archery" options like this). Spontaneous Alchemy isn't terrible - the idea of creating items like Antitoxins, Alchemist's Fire, Trip Arrows, Desiccating Lubricant, Tanglefoot Bags with a standard action, at the cost of a feat is pretty cool. Poisons, Drugs and Alcohol never fall into this category, which are reduced to a minimum of 1 hour instead. If you can take advantage of this, it's probably the best part of the book, and there's a nice 2-page table that covers the details pretty well. There's 6 more fireworks, 4 new "ales" to buff then break you, 16 new "alchemical reagents" that function the same as the Adventurer's Armory alchemical material components (which are great, but I don't see any stand-outs, and all of them are consumed when used). There's actually more if you include reagents that aren't listed with the other Alchemical Reagents on the front and back covers, such as Pesh (under Drugs) and Ginger Extract and Mugwort Extract (under Herbalism). I thought there was an Alchemist archetype in the book, but I can't see it. The book says it covers options for Alchemists, Barbarians, Bards, and Rogues, but there's only a single archetype? Based on a alcohol drinking barbarian? And that archetype isn't referenced in the (very-weak) Contents page. Thankfully the following page has a second sort-of-Contents page that points to pages that have the new alchemical rules in the book (which aren't bookmarked in the PDF version). Basics- Let's Cook! Alchemy Manual is a splat book in the truest sense. 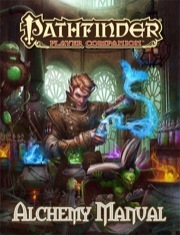 This book moves at a rapid fire pace presenting over 10 different types of alchemy traditions in the Pathfinder world. Each tradition gets two pages to introduce the story behind the alchemy type as well as a few potions or poisons that distinguish one from another. In addition, numerous items, small additions to spells/alchemical items, and new ways to craft alchemical items are presented. 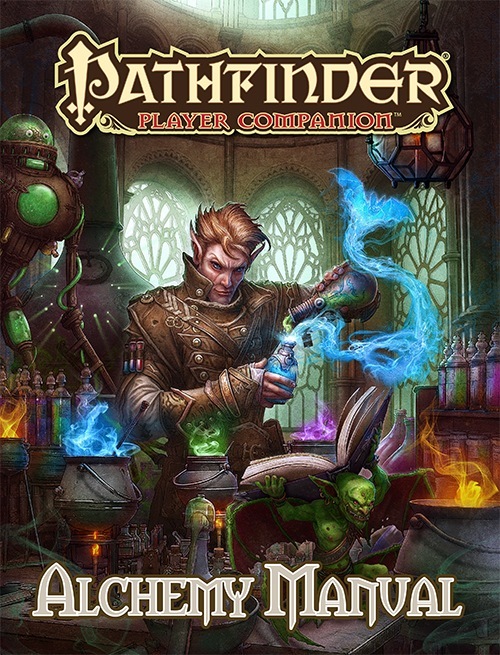 Summary-Alchemy is always a touchy subject in Pathfinder and 3.X games. To powerful and all the players use it. To underpowered and it's a waste of time to introduce it. This book is an ok. Honestly, it won't change your opinion of alchemy. It's well done for the story aspect, but if you are deciding if you want to buy a mechanics supplement, you really have to ask yourself "Do I like alchemy already?" I love this new book, it open up a lot of options for all characters who use alchemy and poison. the new reagent crafting option are fun and add some great flavor, but easy to leave out if you dont want to use them. Some great new alchemical items and a few magic items. it also has rules for using Profession (herbalism) instead of craft (alchemy) If you a you are looking for a Manual on Alchemy this is the book for you. I tend not to get hugely excited by books that are mostly new “crunch” options for the game. The fact of the matter is that Pathfinder has a ton of options already and new ones tend to get lost (in my mind, at any rate) amidst all the others. However, the Alchemy Manual introduces a ton of new options that I can see immediate use for. With alchemy not receiving quite as much attention as feats, spells, and archetypes, this book stands out as a collection of things that truly enhance the game. As such, this is a book that really does excite me. I can’t wait to introduce its new options into my games. Hmm. Thuvia pops up again. Could the Osirion AP be heading that way at some point? More discoveries? Archetypes? SLEEP BOMB! Poisoned bombs! More! Man I wish we had this one now, been waiting for some quality alchemy stuff to float my way. This is the first book in the Player Companion line that has actually made me think "I have got to get that!" Is this where alchemists can finally make various constructs? If so, I'm excited! Actually, I'm excited either way. I'm already starting to drool... :D I love non-magical gear, and alchemy especially. Very cool! Looking forward to this. Yes we need some mad scientist love. This is going to be such a rad book. KAM has already proven that alchemy is way cooler, and way more magical, than science. Yes! I certainly hope that Kevin Andrew Murphy has a part in this. Hmm, tempting, will wait for the updated product description before deciding about pre-ordering, but definitely got my eye on this. I noticed that Kobolds of Golarion introduced a 5k alchemical item that can interfere with teleportation, so I hope there will be more expensive alchemical items that will prove useful at at least up to mid levels. Rules for increasing the DCs of poisons and alchemical items somehow to keep them more relevant would be welcome as well. And just some fun alchemical items would be nice, like alchemically created adhesive skin you can use for a convincing disguise, or perhaps medically? Just some oddball stuff. More stuff for alchemists is likely a given, kind of hope there'll be some plastic surgery style stuff, or maybe bringing in some grafts for alchemists? The body modification aspects of alchemists is pretty fun, though too many of them are self-only, so some you could use on others, whether to make that nose a little more photogenic, or something more extensive, would be nice...vivisectionist is cool, but a bit limited in what you can turn into what. Then again, that might be for a different supplement that delves into the Heal skill more, maybe? Weapons, hmm, I know we've got a syringe spear and something like a chainsaw that runs off a thunderstone as I recall, makes me wonder what they'll be coming up with...sadly I imagine most of them will be exotic weapons. Still, definitely intriguing. Wait, what? What books are these in? Ah, was mixed up with the chainsaw, mentally combining two different weapons. The syringe spear is from Adventurer's Armory, it was basically a spear with a thin tube in the blade and a small container just beneath the crossguard, and a successful hit with it would inject the content of the container into the target. Took awhile to fill, though. The ripsaw glaive is from Gnomes of Golarion, and was basically a glaive with a chain around the blade, mounted on an axle, with a big thick cord around it. Yank on it, and you would do +2 damage for a number of rounds equal to your Strength modifier (ie, how hard you yanked it defined how long it would be spinning for). Acts like a glaive the rest of the time. So yeah, it was basically a chainsaw with reach. The weapon powered by a thunderstone is a piston maul, also from Gnomes of Golarion, a two-handed hammer with an alchemically-powered piston inside it, but it required a thunderstone to run for 24 hours, otherwise it would pretty much just be a greatclub. It did extra damage on a sunder. I haven't bought a PPC book in awhile now, but this will be a definite buy for me. I just wish it was out now so my PFS Alchemist could put it to good use. Will this book have much use in a campaign without the alchemist class (But still with the alchemist profession)? Alchemists can already get their Moreau on. Absolutely! This book is not meant to be the "Complete Guide to Alchemists;" instead, think of it more like "Alchemy For Everyone." While alchemists will of course be well served, so will characters from many other classes and backgrounds. I know what I'll be getting next April. Why??? why does it have to be nearly a year away, Alchemy and Herbalism for everyone have been two of the big things I have always liked in games. Has anyone made a successful character that just makes alchemical devices and uses them without the extacts and other alchemist goodness? I had a Rogue/Shadowdancer that loved poisoning people. Unfortunatly around mid-level he became useless. Of course, that was because my DM one-Shotted him and I made an Alchemist. Go for broke I say, I just hope they finally come up with some rules on actually crafting poisons, not just the "Example" poisons. Speaking of... Anyone know where one could find more Alchemy related fun? Time to make Professor Dolby, or Miss Sakimoto. And you gotta have the blindness bombs. Speaking of... Anyone know where one could find more Alchemy related fun? Dragon magazine 280, article Better Living Through Alchemy, has some great stuff. Issue 301 also has a large article on Alchemy, but I don't recall it specifically. Quite a few (perhaps even all of them!) seem to be reprinted in the Dragon Compendium p 116-120. Of the 'official' 3.5 stuff, I'm partial to the alchemical items introduced in the Eberron Campaign Setting and Oriental Adventures. Am I the only one who saw Gary Gygax instead of Ezren in that (mock)cover? Wonder if there's any chance of a table listing alchemical components and the creatures they come from? Maybe it's been a long kept Alchemist secret that the final ingredient in alchemist fire is dried, ground Goblin. This product is gonna be totally fun. Hopefully, there will be expanded Alchemical Power Components rules. Also, maybe some more devices for delivering chemical payloads, and rules/stats for larger doses of chemicals. Very excited about this player companion! I would love to see an item card deck devoted to alchemy components. I have several decks of item cards and have handed out mushrooms, pearls, and other alchemy items to the alchemist in my game, but I would love to have more alchemy related components/ingredients. I am looking forward to this book. I just made an alchemist and he is pretty fun to play. I normally think very little of alchemical items because characters seem to outgrow them, what with relatively low save DCs and similar pretty much across the board. I'm optimistic about this, though; surely a whole book on the subject will address and revisit a few of the problems with alchemical items like thunderstones and tanglefoot bags, and not just introduce a bunch of ostensibly cool, but ultimately mostly useless, new items. @Morgan Coldsoul: I too wish that the Paizo devs would relinquish this idea of alchemical items being low-level throwaways before magic takes over and makes them obsolete. It's ridiculous that the alchemist is basically a pseudo-spellcaster who can't actually make alchemical items better, just make them quickly or ignore them for his "extracts" (AKA super-potions). As a newly created gnome alchemist I am looking forward to this product! Wait! did it just move up a month? April 30th. Yep either it moved up a month or this is a glitch. If it did move up a month........O.O AWESOME! I really wanted the Alchemist class to be all about creating greatly enhanced versions of traditional alchemical substances (and much more effectively and quickly than the horrible 'Epic Alchemy' rules from the old 3.0 Epic Handbook! ), along with some sort of daily 'free alchemy' allotment of temporary alchemical concoctions similar to the 'free crafting' of the artificer, so that the Alchemist PC wasn't throwing away his WBL to function in a party (although, once he's exceeded his daily allotment of 'free alchemy,' he will indeed start having to throw normally crafted alchemical consumables!). More damaging alchemist's fire, bigger splash radii, tanglefoot bags that affect multiple squares, acid that lasts multiple rounds, higher DCs, etc. But no. We have a couple hundred pages devoted to lists of spells, and everyone must use them. Le sigh. Is the product cover and description going to be updated?